It’s suddenly spring and I have two talks coming up, so I’ve been scrambling to pull together some additional information on the early Oregon fisheries. I’m speaking on Thursday, May 6, at the Mill Casino in Coos Bay, as part of a fund-raiser for the Coos Bay Historical and Maritime Museum. The curator, Vickie Wiese, sent me some wonderful old photographs to use in the talk. 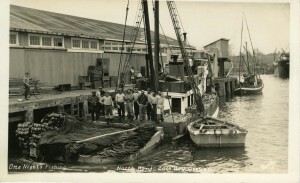 I am posting two of them: the Coos Bay boat basin in the early 1930s (it’s undated), and a second shot of a purse seiner that is almost sinking at the dock with the weight of the catch. As you can see, it’s labeled one night’s fishing for pilchards in Coos Bay, Oregon. 5 purse seine boats. According to Pacific Fisherman, the four processors were from Monterey, and one of them included Kurt Hovden, who is mentioned in my review of Connie Chiang’s book, Shaping the Shoreline. Hovden, a graduate of a Norwegian fisheries school in 1905, is credited with modernizing the California sardine industry. He’s an interesting example of the speed with which technology traveled within the industry. “With every record smashed to bits, the California sardine reduction industry wound up 1934 and, with scarcely a halt for the holidays, went into 1935 at a fast pace,” PF reported breathlessly in the 1935 Yearbook issue. In all, there were 25 reduction plants operating in California, including four floating processors in Northern California. 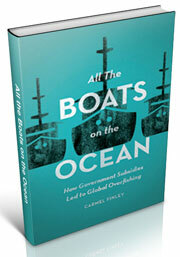 The industry produced 15 million gallons of oil and 3,405 tons of meal. Fishermen got $7 a ton; after August, the price went to $7.50 a ton. “The fishermen did exceptionally well in spite of the fact that there was a very large concentration of gear,” especially in Monterey. The sardine oil sold for 17 cents a gallon, an increase over the 1933 price of 4 cents a gallon. The increase may have because the U.S. imposed an excise tax on fish oil. It is against this backdrop that the four Monterey companies, looking for a new supply of fish, head north to sleepy little Coos Bay, Oregon. Oregon has recently passed a “pilchard law” that authorized the reduction of sardines, according to the May, 1935 issue. But it frustratingly does not say who went to the legislature to get the law changed: was it the California companies? Or was it an Oregon company? Or agricultural interests? This is an area where I will do some additional research. Was there opposition to turning sardines into oil? By June, PF is reporting that the new season has started, with reduction plants operating in both Alaska and Oregon. “The venture into pilchards operations off the Oregon coast is a matter of the keenest interest to the industry and will be watched very closely indeed.” The same issue reports that three plants will be operating in Coos Bay and two on the Columbia River. The three Coos Bay plants will be operated by the Hovden Food Products Corporation, Cypress Fisheries (a subsidiary of the Del Mar Packing Corporation), and the North Bend Fisheries (a subsidiary of the San Carlos Canning Co.). Pacific Sea Products, a subsidiary of Hovden’s, will operate on the Columbia, along with the Santa Cruz Oil Company, operating the floater “Lake Miraflores.” Two local plants also intend to enter the reduction fishery. I’m eager to get a look at the coverage of the start of the pilchard fishery in the pages of the Coos Bay World. Certainly the photograph of the purse seine boat at the dock must have caused not just a local sensation. It’s impossible to read the name of the boat, but it might have been the Nordby, captained by Ed “Barren” Strand, who is pictured in a 1935 issue of PF and called one of the first to land pilchards in Oregon. Oregon and Washington were slow to move into the reduction business. A February, 1935 story reports that in 1925, a Washington attorney general issued an opinion that sardines were a food fish and that the law would have to be changed in order to reduce them for oil. 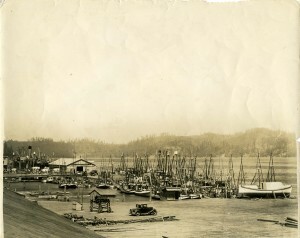 There was no similar opinion in Oregon, but state law prohibited the operation of purse seiners in state waters, so the fishery had to be legalized. The ban on purse seining was a measure designed to prevent seining for salmon. PF solved one of my questions: what’s the difference between a California sardine and an Oregon pilchard? Both are members of the herring family, Clupeidae, and young herring are known as sardines. This was according to Dr. W. A. Clemens, director of the Pacific Biological Station in Nanaimo. He wrote that B.C. 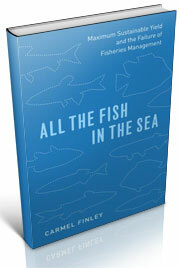 the industry began in 1917 and expanded rapidly after 1925, when the fish were first reduced for oil and meal. Little is known of them biologically, except that they may spawn off California’s Santa Barbara in early June. It would take another three years of work, up and down the coast, for scientists to conclude that the fish taken from California to Alaska, and known as both sardines and pilchards were the same fish, harvested throughout its range. Janet Gilmore, A World of the Oregon Fishboat: A Study of Maritime Folklife,(Ann Arbor: UMI Research Press, 1981, 1986), 42. Pacific Fisherman, February, 1934, 33. Pacific Fisherman, November, 1934, 46. 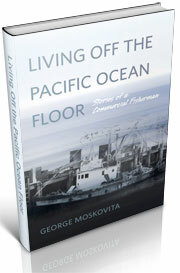 Pacific Fisherman Yearbook, 1935, 47. Pacific Fisherman, May, 1935, 63. Pacific Fisherman, June, 1935, 59. Pacific Fisherman, February, 1935, 54. Pacific Fisherman, February, 1934, 21. This entry was posted in California sardines, Carmel Finley, Environmental History, fisheries science, Fishing, History of Science, History of Technology, Maritime History, Ocean fishing, Oregon pilchards, Overfishing, Pacific Fishing History Project, World History and tagged Califonria sardines, Coos Bay Historical and Maritime Museum, Coos Bay World, Janet Gilmore, Kurt Hovden, Pacific Fisherman, pilchards, sardines. Bookmark the permalink.